The Trades Council banner featured at the annual commemoration of the nuclear attack on the Japanese city of Hiroshima on Monday 6 August in Camden’s Tavistock Square. Upwards of 250 people attended the event, organised by the Campaign for Nuclear Disarmament and hosted by veteran left Labour MP Jeremy Corbyn, the event remembered the tens of thousands killed outright and the many others maimed by the US Air Force bombing of Hiroshima and Nagasaki, but also made a call for a nuclear-free world. Local resident, Hetty Bower, who is 106, was among the speakers, who were joined by the former Dr Who actor Sylvester McCoy and Celia Mitchell, the widow of leading poet Adrian Mitchell. Several speakers including Tony Benn called for the scrapping of the programme to replace the Trident missile system and argued that cuts to social welfare and other public sector programmes were all the more intolerable while governments earmarked billions for weapons of mass destruction. 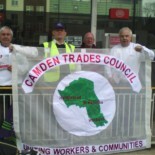 This entry was posted on August 7, 2012 by CAMDEN TRADES COUNCIL.